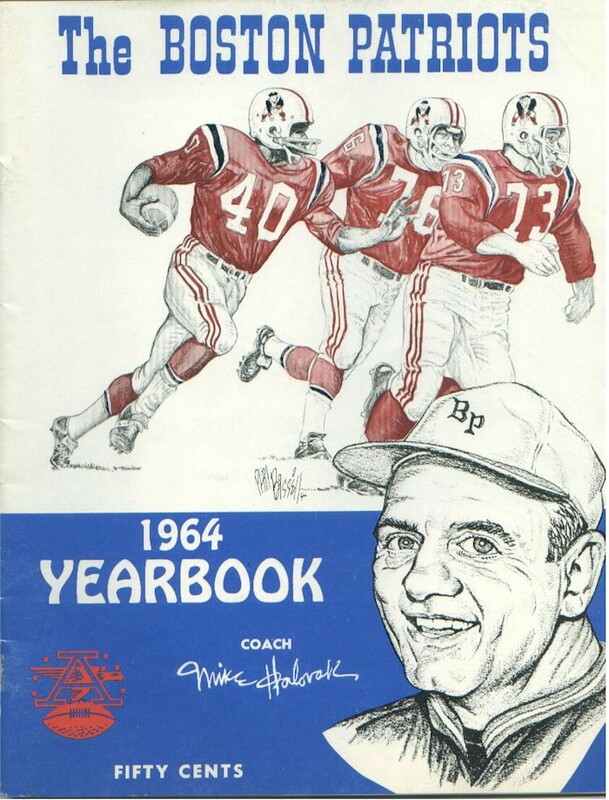 The Boston Patriots played the American Football League's first-ever game, against the Denver Broncos on September 9, 1960. 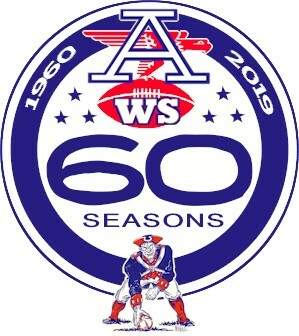 Although the team made only two AFL playoff appearances, it had numerous stars. In 1963, eleven Patriots made the AFL All-star team, including Gino Cappelletti, Nick Buoniconti, and Babe Parilli. 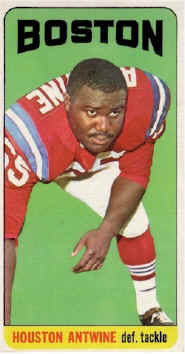 In the late 1960's, fullback Jim Nance became a powerful offensive weapon for the Patriots, gaining 1,458 yards in 1966 and 1,216 in 1967, when he was the American Football League's Most Valuable Player. 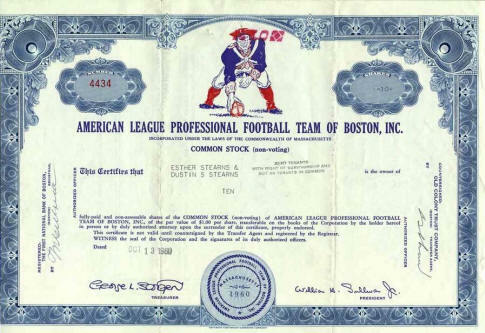 In 1960 the team had a public stock offering (see the image above) of 120,000 shares at $4.75/share. 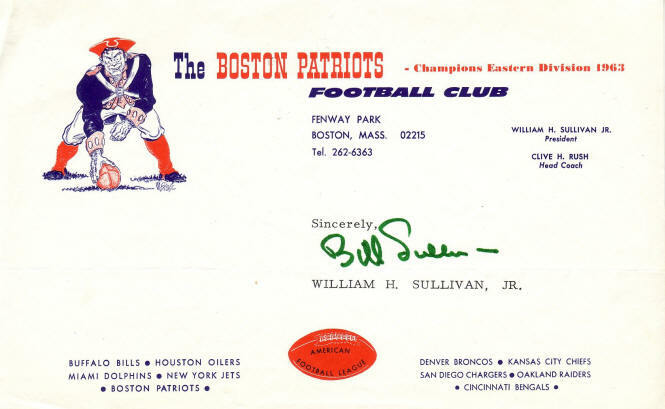 When the AFL and the NFL merged in 1970, Billy Sullivan bought back all outstanding shares at $25/share. 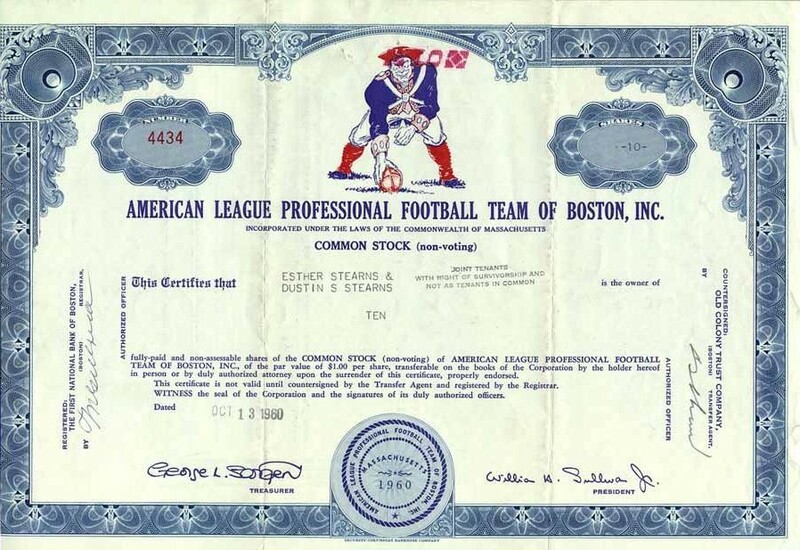 The Patriots were the only AFL team to have a stock offering. 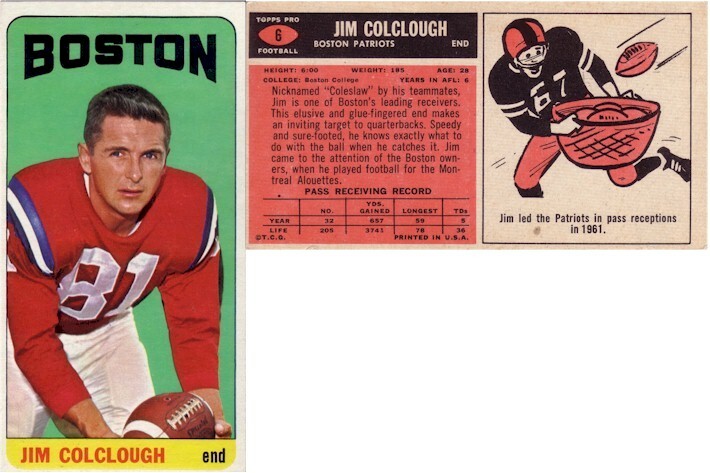 Original Boston Patriot Jim Colclough died on Sunday, May 16, 2004 at age 68. 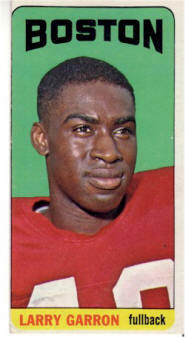 Colclough's 10 receptions for touchdowns and 21.7 yards per reception in 1962 earned him a spot on that year's American Football League All-Star Team. Colclough was a wide receiver for nine seasons, to 1968, with the Pats, appearing in 126 games and scoring 39 tds. He was the receiver opposite Gino Cappelletti on strong Patriots teams of the '60s that featured qb Babe Parilli and running backs Ron Burton and Jim Nance. The New England Patriots lost an original member of the franchise's family over the weekend with the death of Walt Cudzik, who died at his home in Gulf Shores, Alabama on Sunday, December 11, 2005. He was 73. 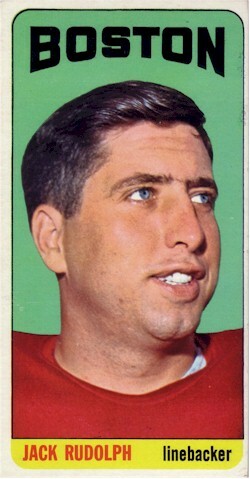 Cudzik joined the American Football League's (AFL) Boston Patriots in their inaugural season in 1960. For the next four seasons, he anchored the offensive line as the team's center, appearing in all 56 games from 1960-63. 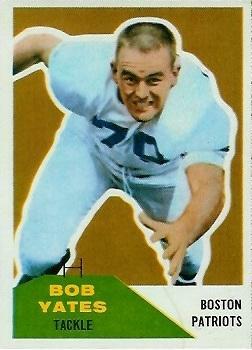 In 1963, the veteran offensive lineman was named an offensive team captain. That year, the Patriots won their first division title and played in their first AFL Championship game. In 1964, Cudzik was traded to the Buffalo Bills, and was the starting center in their AFL Championship game victory over the San Diego Chargers. An offensive tackle at the University of South Carolina, Tommy Addison is a member of the South Carolina Athletic Hall of Fame. As an original Boston Patriot, he was converted to linebacker in the pros. He showed his versatility by adapting to the new position so well that he made the American Football League All-Star team in 1961, '62, '63, and '64, when he was the Patriots' team captain. He was a rugged, aggressive defender, rarely allowing opposing runners to see daylight. 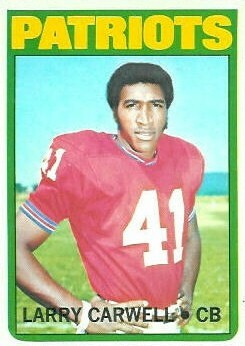 His career ended after 1967 by injuries, he accumulated 16 interceptions in his eight years of play. 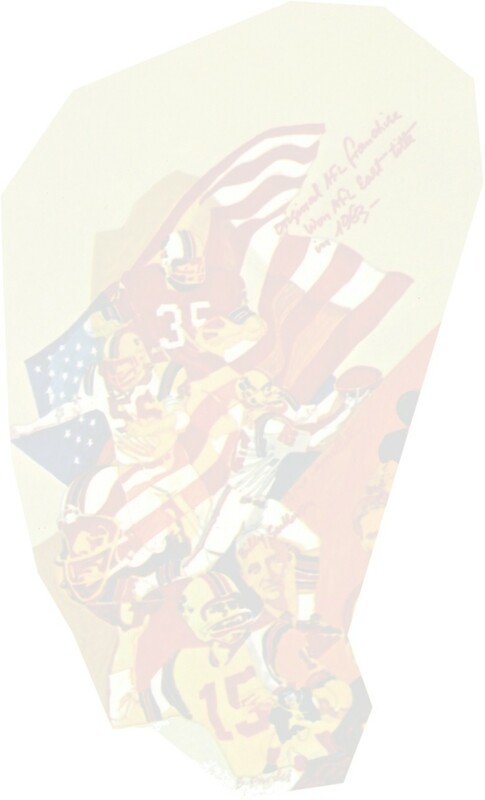 Off the field, in early 1964, his lead role in establishing and serving as the first president of the American Football League Players Association was instrumental in obtaining, for AFL players, viable pension, medical and insurance plans. With a players association in place, players newly drafted by AFL teams in the "war between the leagues" could be assured that they would have representation and protection in the AFL that was the equal of that in the older league. Addison's work was an important element in the survival of the league, and helped the AFL to be able compete for top talent, and to establish itself as the future of professional football. 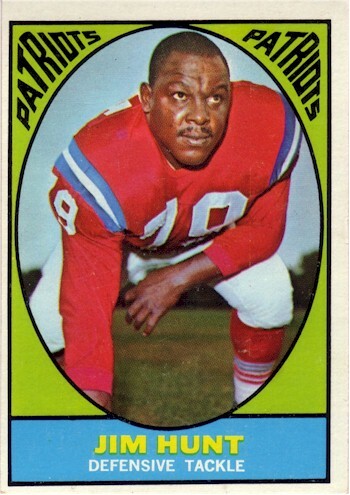 In 1961, defensive tackle Houston Antwine was drafted by the Boston Patriots from Southern Illinois University, where he is in the school's Athletic Hall of Fame. A former NAIA wrestling champion, stocky "Twine" was nearly impossible to move out of the middle. Antwine was cited by fellow Hall of Famer Billy Shaw as one of the American Football League's best pass rushers, athletic and very quick on his feet. He usually drew double-team blocking. He was an American Football League All-Star six straight years, from 1963 through 1968, and was named to the All-Time All-AFL Team. As a tackle, Nick Buoniconti was the captain of the 1961 Notre Dame football team, but was considered by NFL scouts as "too small" to play Pro Football. 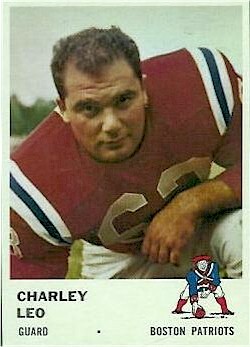 Drafted by the Boston Patriots in the 1962 AFL draft and switched to linebacker, he made an immediate impact, being named the Pats' rookie of the year. 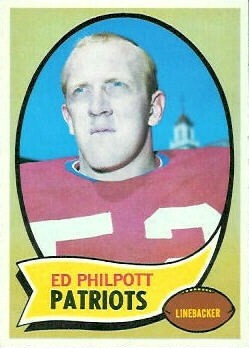 In 1963 he helped Boston capture the AFL Eastern Division title. 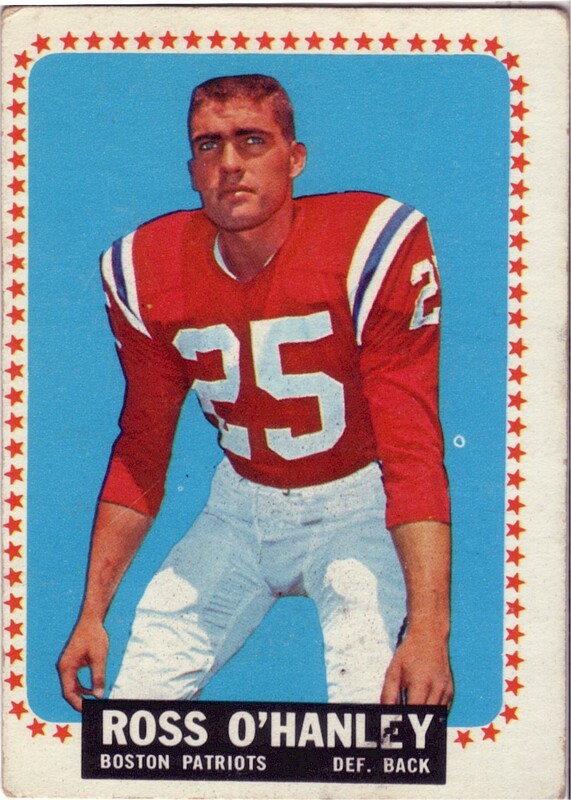 With Boston, he recorded 24 interceptions, which is still the 7th-most in team history, and appeared in five straight AFL All-Star Games, 1963-1967. He was 2nd team All-AFL in 1963, and in 1964 began a run of four straight consensus All-AFL seasons, until 1968, when he was named second-team All-AFL. Traded to the Miami Dolphins for the 1969 season, he again made the AFL Eastern Division All-Star Team, and was selected as a consensus All-AFL. Buoniconti is a member of the Patriots All-1960s (AFL) Team and though he may be remembered by younger fans as a great Dolphins player, had sufficient credentials as a Patriot to be named to the AFL's All-Time Team, based primarily on his stellar play in Boston. A former high-school All-American, Ron Burton became a college All-American running back at Northwestern University, a member of the Northwestern Hall of Fame, and a member of the College Football Hall of Fame. 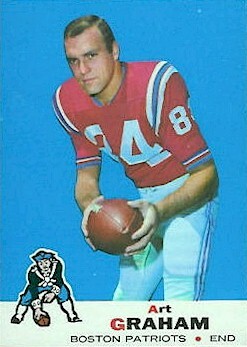 Burton was the Boston Patriots' first-ever draft choice in 1960. 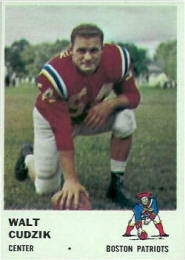 He was the first Patriot to rush for over 100 yards: 127 against the Denver Broncos on 10/23/1960. 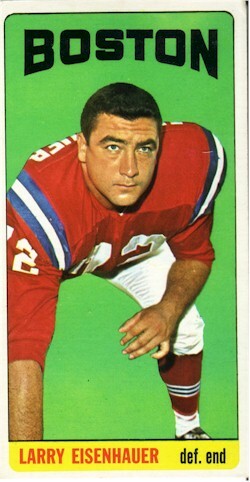 He compiled 1,009 combined yards in rushing and receiving in 1962, and provided strong depth at running back for the Patriots from 1960 through 1965. 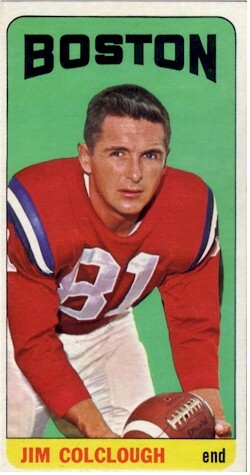 His 91-yard touchdown return on a missed field goal in 1962 remains a Patriot record. After leaving Professional Football, this former child of poverty became an eminently successful motivational speaker who then made a major financial and emotional gift to needy children. In Massachusetts, he donated land for and established the Ron Burton Training Village, which holds free summer camps for disadvantaged inner-city youths. 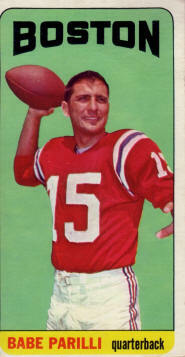 Gino Cappelletti of the University of Minnesota played for the Patriots from 1960 through 1970. Cappelletti retired as the Boston Patriots' all-time leading scorer with 1,130 points (42 TDs, 176 FGs and 342 PATs), he led the American Football League in scoring five times and had two of the top five scoring seasons in pro football history  155 points in 1964 and 147 points in 1961 (14-game seasons). He was the all-time leading scorer in the American Football League. Cappelletti is among the AFL's all-time top ten receivers, in yards and in receptions. The Patriots' third all-time leading receiver with 292 catches for 4,589 yards, he holds Patriots' records for extra points attempted (353), extra points made (342), FGs attempted (333) and FGs made (176). Cappelletti returned punts and kickoffs, played defensive back, and even had one pass completion, for a touchdown. At the end of the AFL's existence in 1969, Cappelletti was the third leading scorer in the history of Professional Football. Cappelletti was the American Football League's Most Valuable Player in 1964, a five-time American Football League All-Star, and one of only twenty players who were in the American Football League for its entire ten-year existence. He is one of three who played in every regular season game their teams played in the AFL, 140 consecutive games. 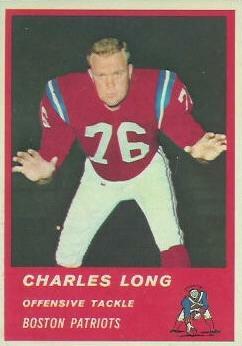 He also played in both the Patriots' AFL playoff appearances. Cappelletti is the only player in Professional Football history to run for a 2-point conversion, throw a pass for a 2-point conversion, catch a pass, intercept a pass and return a punt and a kickoff in the same season. 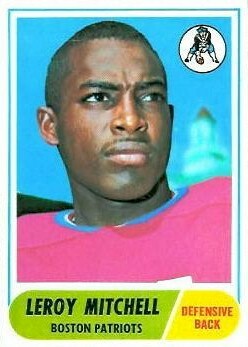 Larry Carwell was a cornerback who played college football at Iowa State University, and played professionally in the American Football League for the Houston Oilers in 1967 and 1968, and for the Boston Patriots in 1969. He had interception returns of over 60 yards for touchdowns for both teams. In 1984, he was a United States Drug Enforcement Agency (DEA) officer working to stop the flow of marijuana and cocaine into the United States from Latin America. While aboard a U.S. helicopter bound for the Bahamas, he was one of five missing persons lost at sea when the helicopter crashed. 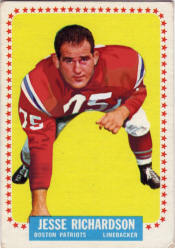 Bob Dee was a three-sport letterman at Holy Cross College and was one of the first players signed by the Boston Patriots in 1960. He became an ironman of the American Football League who never missed a game during his career, starting 112 consecutive games. Despite equipment improvements over the years, Dee was a superstitious player who chose to wear the same helmet throughout his career (105 of 112 games). Dee scored the first touchdown in American Football League history when he dove onto a fumble in the end zone in an exhibition contest vs. he Buffalo Bills, in July 1960. He was voted to five American Football League All-Star teams (1961, 1963-65). His mother, Mildred Wiley, was an Olympic high jump bronze medalist in 1928, the first year women were allowed in the track and field games. 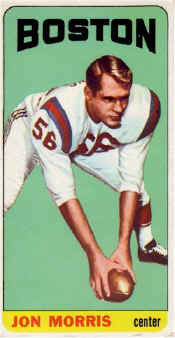 Larry Eisenhauer, a Boston College standout, was one of several Boston-area athletes to join the American Football League's Boston Patriots, and one of many hall-of-fame calibre players in the 1961 AFL draft. He was nicknamed "Wildman" by his Patriot teammates because of his unpredictable antics, such as running out onto Kansas City's snow-covered Municipal Stadium field clad in only his helmet and athletic supporter, hitting his head on metal locker doors or ramming his forearms through locker room walls to motivate himself. 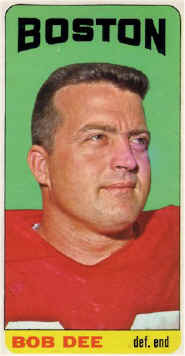 Eisenhauer was an American Football League All-Star in 1962, 1963, 1964 and 1966. 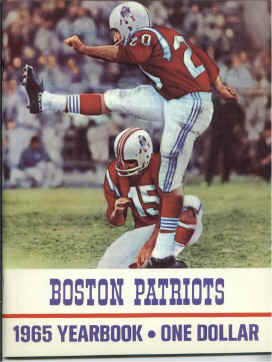 Larry Eisenhauer is in the Boston College Athletic Hall of Fame, and is a member of the All-1960s Patriots Team. 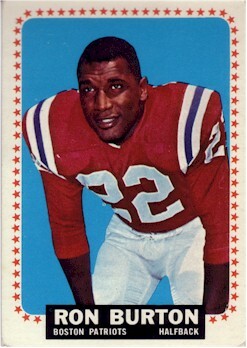 Larry Garron starred at Western Illinois University before going to the Patriots. 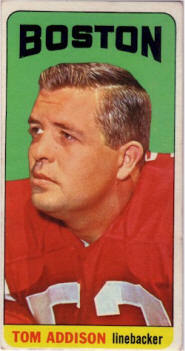 Head coach Lou Saban had recruited Garron in 1960, but the running back contracted tonsillitis and was cut after three games. He came roaring back the following season 20 pounds heavier, all of it muscle, and averaged nearly 6 yards per carry. Garron holds the team record run of 85 yards from scrimmage, set in a game against the Buffalo Bills on October 22, 1961. 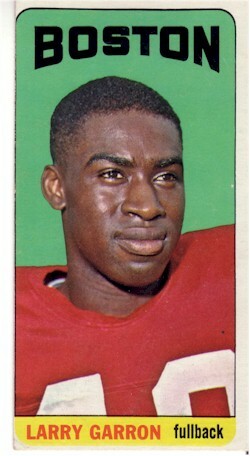 He averaged 5.9 yards per carry in 1962 and accounted for 1,168 total yards from scrimmage in 1963. 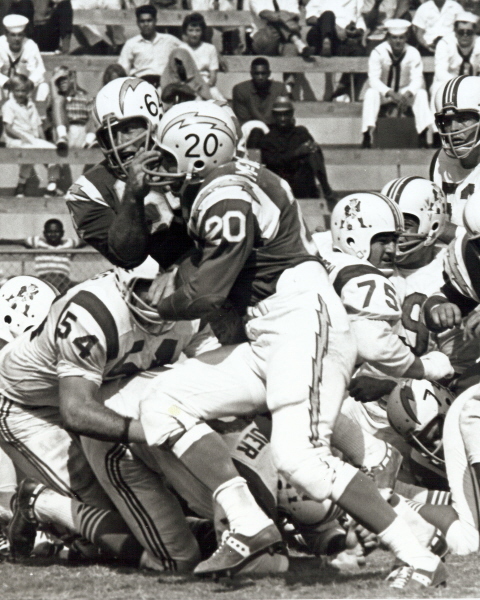 After Jim Nance joined the team, Garron became the superb lead blocker that allowed Nance to gain over 1,400 yards in 1966, his second season. Garron was an American Football League All-Star in 1961, 1963, 1964 and 1967, and is a member of the Patriots' All-1960s (AFL) Team. He is a 1974 inductee of the Western Illinois Athletic Hall of Fame. Jim Lee Hunt was a lineman from Prairie View A&M University who played offensive and defensive tackle for the Patriots from 1960 through 1969. After recovering a fumble as a rookie and trudging 11 yards with opponents' bodies scattered everywhere, he was nicknamed 'Earthquake' Hunt. At 255 pounds, he enhanced that sobriquet by rumbling 78 yards for a touchdown against the Oilers in 1963, on an interception of a George Blanda pass, outrunning Oiler running backs Billy Cannon and Charlie Tolar. A ferocious pass-rusher, Hunt was an AFL All-Star in 1961, 1966, 1967 and 1969. In his prime, he was considered the best pass-rushing tackle in the league. Hunt was one of only twenty men to play the entire ten years of the American Football League. A member of the Patriots' Hall of Fame, his number 79 was retired by the team, which named its annual Best Lineman award the Jim Lee Hunt Trophy. Jon Morrris was a sensational three sport athlete in high school and played center and linebacker for three seasons at Holy Cross College, where he was the New York Daily News' "Athlete of the Year" in 1960 and Varsity Club Athlete of the Year and Lineman of the Year in 1963. 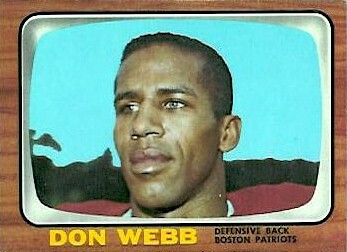 He was an American Football League All-Star six times, 1964 through 1969, and played 128 games for the Patriots (eighth best individual record in club history). Morris was named to the second team, American Football League All-Time Team. In 2011, Jon Morris was selected to the Patriots' Hall of Fame. Click HERE to read more. 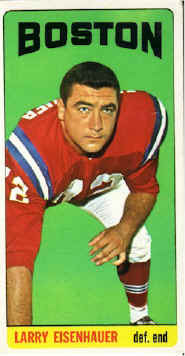 After tying the school record for career touchdowns (13) at Syracuse University and leading the Orange in rushing in 1964, scoring in ten straight games, Jim Nance was a late-round draft choice of the Boston Patriots in 1965. He went on to become the only AFL player ever to rush for more than 1,400 yards in a season. 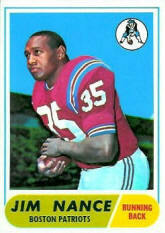 At 6'-1" and 243 pounds, Nance was a classic fullback who carried 299 times in 1966, for 11 touchdowns and 1,458 yards. That season, he rushed for 208 yards and two touchdowns in a 24-21 victory over the Oakland Raiders. Nance was an American Football League All-Star in 1966, when he also received the league�s Most Valuable Player award, and an All-Star again in 1967, when he became one of only two AFL players to have two seasons rushing for over 1,000 yards, this time for 1,216. Nance retired as the Patriots� all-time leading rusher, and still holds the team record for career touchdowns, 45. In 2009, he was finally inducted to the Patriots' Hall of Fame. Owner Bob Kraft said: "He was an attraction. He brought fans to the games and that was very important in building a loyal fan base. "Four decades later, we still have many season ticket holders who became fans of the Patriots in the 1960s because of players like Jim Nance. The fact that he still holds some prominent rushing records 38 years after his playing career speaks volumes." Vito "Babe" Parilli of the University of Kentucky was an All-American starting quarterback for the Wildcats under Coach Paul "Bear" Bryant, and is a member of the College Football Hall of Fame. He was an example of the NFL's lack of player evaluation skills. 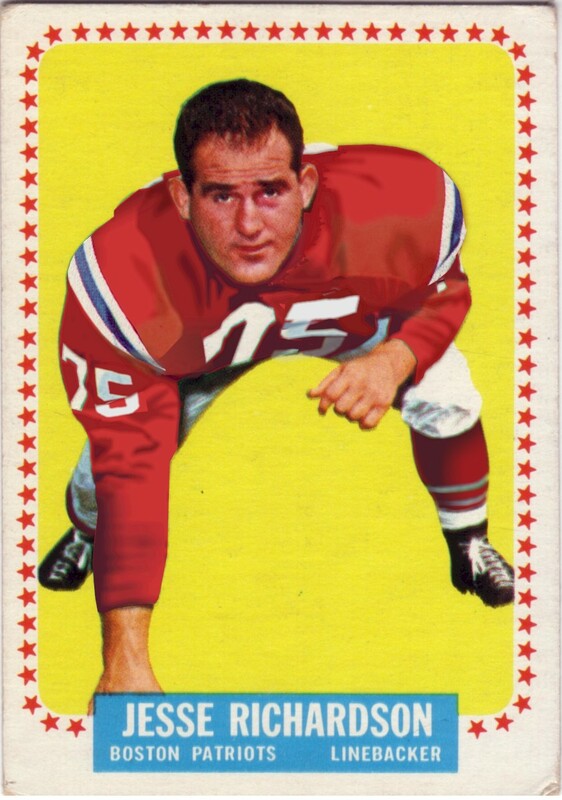 Branded as an "NFL reject", Parilli was picked up by the Oakland Raiders in 1960, and later, as a Boston Patriot, went on to become one of the American Football League's most productive and colorful players. 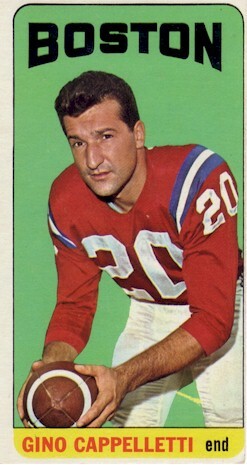 Parilli played for the Patriots from 1961 through 1966, and was a three-time American Football League All-Star. 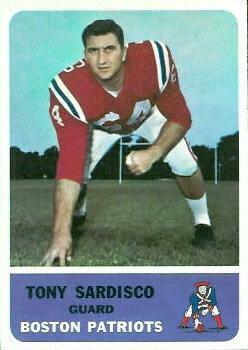 In 1964, throwing to fellow Hall of Famer Gino Cappelletti, he amassed nearly 3,500 yards passing, with 31 touchdowns. That season, on October 16th, he threw for 422 yards against the Oakland Raiders, with four touchdown passes, in a 43-43 tie! Parilli completed his career with the New York Jets, where after the 1968 season in the Third World Championship Game, he earned a ring as Joe Namath's backup in the destruction of the Colts. He is one of only twenty players who were in the American Football League for its entire ten-year existence. He is also in the University of Kentucky Athletic Hall of Fame. 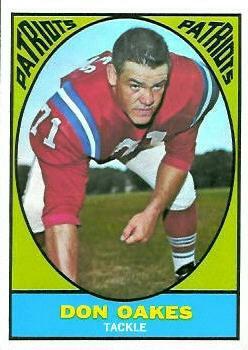 Jesse 'Jess' Richardson, a linebacker at the University of Alabama, came to the Patriots after eight years in the other league, playing left defensive tackle in every game for the Pats from 1962 through 1964. Richardson had the distinction of being the last man to ever play Professional Football in a helmet without a facemask.